Run into code that doesn’t work? Does a command or concept need a clearer explanation? Find an awkward phrase that keeps tripping you up? Thank you for taking the time to report a problem or suggest a change. Your assistance is crucial for helping us maintain the best possible lessons! Contact Adam Crymble or one of the other members of our Project Team. You can also tweet @ProgHist. This is our preferred way of handling feedback since all our editors are able to see and respond to your issue. 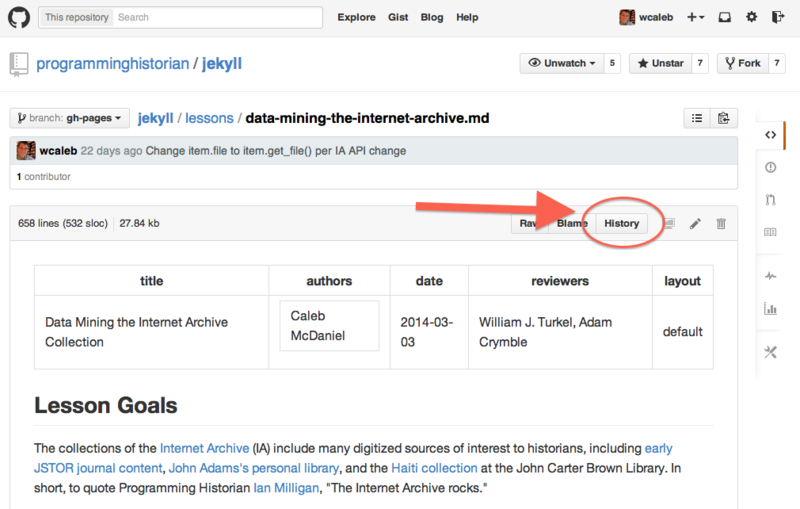 First, sign up for a free, personal GitHub account if you don’t already have one. Log in if you already have an account. Then, go to the issues page for our Repository. 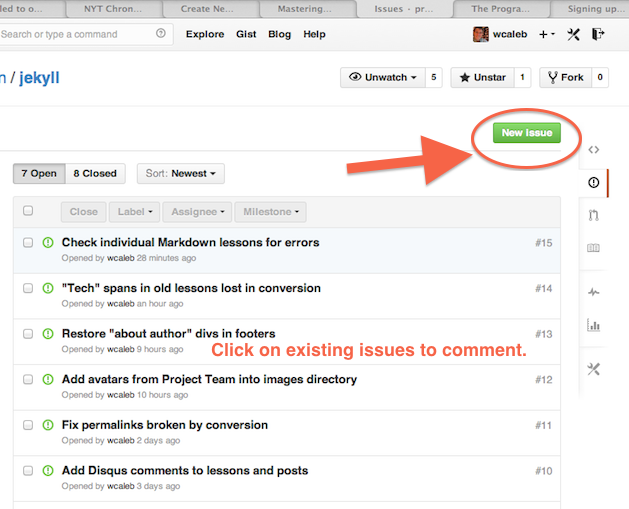 Glance at the open issues to see if the problem you have identified has already been reported. If it has, but you have additional information to share, leave a comment on that issue. If your issue has not been reported, create a new issue with a descriptive title and as much information about the problem as you can give. 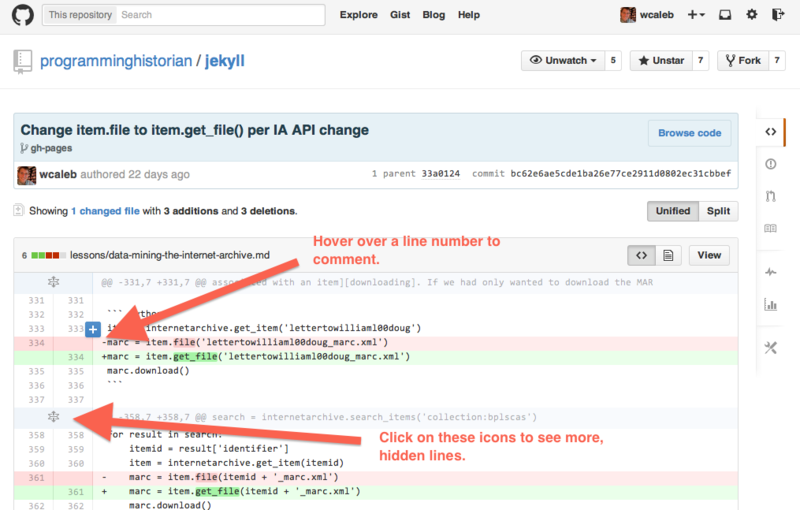 For more information about GitHub issues, read the GitHub Guide on Mastering Issues. To suggest or make minor changes to a lesson, first navigate to the lessons directory and click on the relevant lesson. Next, to comment on a line, hover over a line number, and a blue plus-sign will appear; clicking on it will open a comment box for that particular line. The line that needs fixing may be hidden; if so, click on the expand icon to show hidden lines. Editors will be notified of these comments and can then incorporate your suggestions into the lesson. As much as we strive for openness, only Programming Historian editors can make changes directly to the lessons at this time. If you believe you know how to fix the problem in the lesson, you may wish to consider forking our repository and making a pull request. For more information on pull requests, see the GitHub Guide on Forking Projects or Rich Jones’s tutorial on How to GitHub. 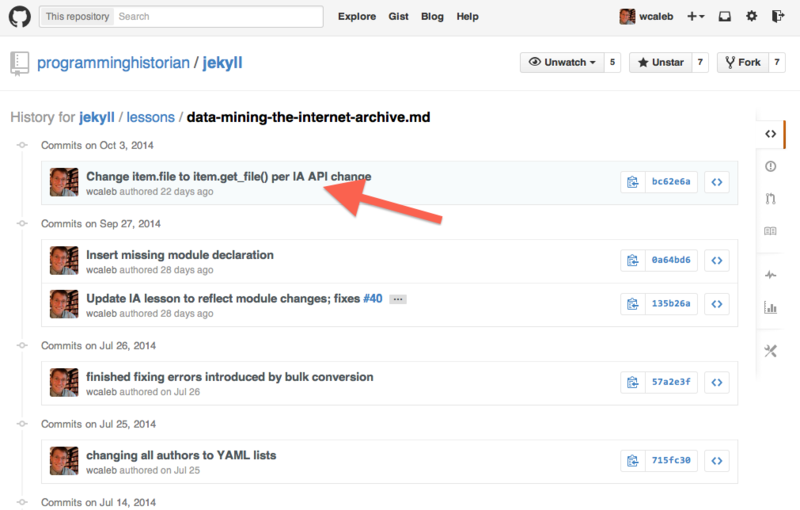 Using Git and GitHub can be fairly simple once you get the hang of it. If you are interested in learning more and contributing, the GitHub website is a great place to start.